Definition at line 56 of file llcombobox.h. Definition at line 60 of file llcombobox.h. Definition at line 59 of file llcombobox.cpp. References LLView::addChild(), FALSE, FOLLOWS_BOTTOM, FOLLOWS_LEFT, FOLLOWS_RIGHT, FOLLOWS_TOP, LLRectBase< Type >::getHeight(), LLImageProviderInterface::getUIImageByID(), LLRectBase< Type >::getWidth(), LLFontGL::LEFT, llmax(), mArrowImage, mArrowImageWidth, mBorder, mButton, mKeyboardFocusOnClick, mList, LLView::mRect, LLStringBase< char >::null, NULL, onButtonDown(), onItemSelected(), onListFocusChanged(), r, S32, LLUI::sAssetsGroup, SCROLLBAR_SIZE, LLScrollListCtrl::setBgWriteableColor(), LLScrollListCtrl::setCommitOnKeyboardMovement(), LLUICtrl::setFocusChangedCallback(), LLView::setFollows(), LLButton::setFont(), LLButton::setHAlign(), LLButton::setMouseDownCallback(), LLButton::setRightHPad(), LLView::setVisible(), LLUI::sImageProvider, LLFontGL::sSansSerifSmall, and TRUE. Definition at line 128 of file llcombobox.cpp. Definition at line 93 of file llcombobox.h. Definition at line 297 of file llcombobox.cpp. References LLScrollListCtrl::addSimpleItem(), mList, and LLScrollListCtrl::selectFirstItem(). Definition at line 289 of file llcombobox.cpp. References LLScrollListCtrl::addSimpleItem(), mList, LLScrollListCtrl::selectFirstItem(), and LLScrollListItem::setUserdata(). Definition at line 282 of file llcombobox.cpp. Definition at line 275 of file llcombobox.cpp. Referenced by LLPreviewGesture::addAnimations(), LLScriptEdCore::addHelpItemToHistory(), LLPreviewGesture::addKeys(), LLPreviewGesture::addModifiers(), LLPanelGroupInvite::impl::addRoleNames(), LLPanelLogin::addServer(), LLPreviewGesture::addSounds(), fromXML(), LLPanelObject::getState(), LLFloaterTestImpl::LLFloaterTestImpl(), LLPanelLogin::LLPanelLogin(), LLScriptEdCore::onBtnDynamicHelp(), LLFloaterSettingsDebug::postBuild(), LLPanelObject::postBuild(), LLPanelGeneral::postBuild(), LLPanelDisplay::postBuild(), LLPanelClassified::postBuild(), LLPanelDeviceSettings::refresh(), LLFloaterBuyLandUI::refreshUI(), LLPanelGroupInvite::update(), and LLFloaterTools::updatePopup(). 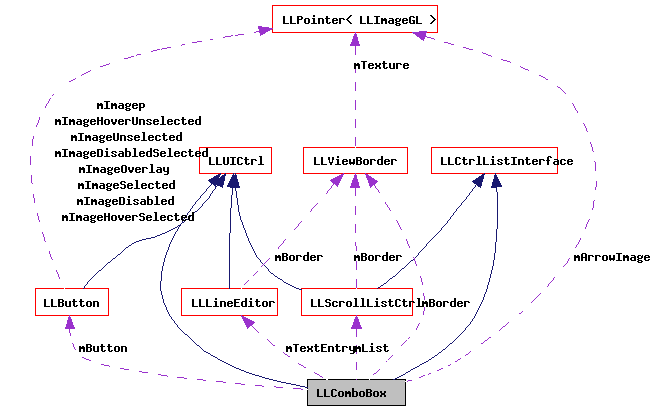 Definition at line 1007 of file llcombobox.cpp. References LLScrollListCtrl::addColumn(), LLScrollListCtrl::clearColumns(), and mList. Definition at line 1023 of file llcombobox.cpp. Definition at line 1028 of file llcombobox.cpp. Definition at line 228 of file llcombobox.cpp. References LLScrollListCtrl::deselectAllItems(), mButton, mList, mTextEntry, LLStringBase< char >::null, LLButton::setDisabledLabel(), LLButton::setDisabledSelectedLabel(), LLButton::setLabelSelected(), LLButton::setLabelUnselected(), and LLLineEditor::setText(). Referenced by LLPanelGroupInvite::clear(), LLPanelObject::getState(), LLPanelPermissions::refresh(), LLPanelGroupInvite::update(), and LLPanelGroupInvite::updateLists(). Definition at line 1013 of file llcombobox.cpp. Definition at line 1033 of file llcombobox.cpp. Referenced by operateOnAll(), and removeall(). Definition at line 452 of file llcombobox.cpp. 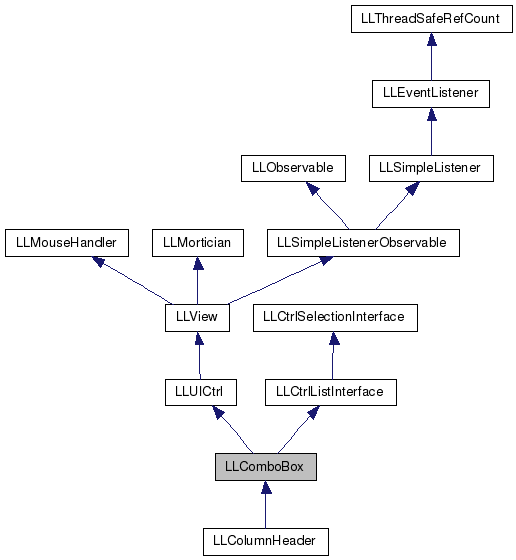 References LLView::draw(), LLRectBase< Type >::getHeight(), LLControlGroup::getS32(), LLView::getVisible(), LLRectBase< Type >::getWidth(), gl_draw_scaled_image(), LLUICtrl::hasFocus(), LLPointer< Type >::isNull(), left, llmin(), llround(), mArrowImage, mBorder, mButton, mDrawArrow, LLView::mEnabled, LLView::mRect, S32, LLUI::sConfigGroup, LLView::setEnabled(), LLViewBorder::setKeyboardFocusHighlight(), and LLColor4::white. Definition at line 166 of file llcombobox.cpp. References add(), LLView::createRect(), FALSE, LLUICtrl::initFromXML(), LLComboBox(), llendl, llerrs, LLPointer< Type >::notNull(), NULL, S32, selectFirstItem(), and setAllowTextEntry(). Definition at line 152 of file llcombobox.h. Definition at line 1057 of file llcombobox.cpp. Referenced by LLFloaterChat::onClickMute(), LLPanelGroupInvite::impl::submitInvitations(), and LLPanelGroupInvite::update(). Definition at line 489 of file llcombobox.cpp. References LLScrollListCtrl::getFirstSelected(), LLScrollListCtrl::getItemIndex(), and mList. Referenced by LLScriptEdCore::addHelpItemToHistory(), LLPanelFaceSetTEFunctor::apply(), LLPanelDisplay::applyResolution(), commit_grid_mode(), LLPreviewGesture::createGesture(), LLColumnHeader::draw(), getFirstSelectedIndex(), LLPanelFace::getState(), LLPanelObject::getVolumeParams(), onCommit(), LLPanelPermissions::onCommitClickAction(), LLFloaterSnapshot::Impl::onCommitLayerTypes(), LLFloaterSnapshot::Impl::onCommitResolution(), onFocusLost(), LLColumnHeader::onSelectSort(), LLFloaterBuyLandUI::runWebSitePrep(), LLPanelFace::sendBump(), LLPanelClassified::sendClassifiedInfoUpdate(), LLPanelFace::sendShiny(), LLPanelFace::sendTexGen(), LLFloaterBuyLandUI::startBuyPreConfirm(), and LLFloaterTools::updatePopup(). Definition at line 500 of file llcombobox.cpp. References LLScrollListCtrl::getFirstSelected(), LLScrollListItem::getUserdata(), mList, and NULL. Referenced by LLFloaterSettingsDebug::draw(), LLFloaterSettingsDebug::onClickDefault(), LLFloaterSettingsDebug::onCommitSettings(), and LLFloaterSettingsDebug::onSettingSelect(). Definition at line 155 of file llcombobox.h. Definition at line 1002 of file llcombobox.cpp. Referenced by LLFloaterSnapshot::Impl::comboSetCustom(), LLPanelObject::getState(), LLPanelObject::postBuild(), remove(), LLPanelGroupInvite::updateLists(), and LLPanelDisplay::~LLPanelDisplay(). Definition at line 137 of file llcombobox.h. Referenced by LLChatBar::refresh(), and LLChatBar::refreshGestures(). Definition at line 136 of file llcombobox.h. Definition at line 338 of file llcombobox.cpp. References LLScrollListCtrl::getSimpleSelectedItem(), LLLineEditor::getText(), mAllowTextEntry, mList, and mTextEntry. Referenced by LLPanelDeviceSettings::apply(), LLPanelDisplay::applyResolution(), LLPreviewGesture::createGesture(), LLFloaterWorldMap::onAvatarComboCommit(), LLFloaterChat::onClickMute(), onCommit(), LLFloaterTestImpl::onCommitCombo(), and LLFloaterWorldMap::trackLandmark(). Definition at line 351 of file llcombobox.cpp. Definition at line 1071 of file llcombobox.cpp. Definition at line 357 of file llcombobox.cpp. References LLScrollListCtrl::getFirstSelected(), LLLineEditor::getValue(), LLScrollListItem::getValue(), mAllowTextEntry, mList, and mTextEntry. Referenced by LLPanelDisplay::applyResolution(), LLPanelLogin::getLocation(), LLPanelLogin::getServer(), LLFloaterTestImpl::onCommitCombo(), LLPanelGeneral::refresh(), and LLChatBar::refreshGestures(). Definition at line 77 of file llcombobox.h. Definition at line 76 of file llcombobox.h. Definition at line 134 of file llcombobox.cpp. References LLSD::asString(), FALSE, LLScrollListCtrl::getAllData(), LLScrollListCell::getText(), LLUICtrl::getXML(), mAllowTextEntry, mList, mMaxChars, and TRUE. Definition at line 748 of file llcombobox.cpp. References LLFocusMgr::childHasKeyboardFocus(), FALSE, LLScrollListCtrl::getItemIndex(), LLScrollListCtrl::getLastSelectedItem(), gFocusMgr, LLScrollListCtrl::handleKeyHere(), LLScrollListCtrl::highlightNthItem(), mList, and showList(). Definition at line 715 of file llcombobox.cpp. References FALSE, LLRectBase< Type >::getHeight(), LLView::getShowNamesToolTip(), LLView::getVisible(), LLRectBase< Type >::getWidth(), LLView::localPointToScreen(), LLRectBase< Type >::mBottom, LLRectBase< Type >::mLeft, LLView::mRect, LLRectBase< Type >::mRight, LLView::mToolTipMsg, LLRectBase< Type >::mTop, LLView::pointInView(), LLUI::sShowXUINames, and TRUE. Definition at line 770 of file llcombobox.cpp. References LLFocusMgr::childHasKeyboardFocus(), FALSE, LLScrollListCtrl::getItemIndex(), LLScrollListCtrl::getLastSelectedItem(), gFocusMgr, LLScrollListCtrl::handleUnicodeCharHere(), LLScrollListCtrl::highlightNthItem(), mList, and showList(). Definition at line 610 of file llcombobox.cpp. References FALSE, LLFocusMgr::getTopCtrl(), gFocusMgr, LLScrollListCtrl::highlightNthItem(), mButton, mList, NULL, LLButton::setToggleState(), LLFocusMgr::setTopCtrl(), and LLView::setVisible(). Referenced by LLColumnHeader::onClick(), and onFocusLost(). Definition at line 254 of file llcombobox.cpp. References FALSE, LLScrollListCtrl::isDirty(), and mList. Referenced by LLPanelClassified::checkDirty(), and LLPanelLogin::getServer(). Definition at line 1076 of file llcombobox.cpp. Definition at line 630 of file llcombobox.cpp. Definition at line 241 of file llcombobox.cpp. References FALSE, getCurrentIndex(), getSimple(), mAllowTextEntry, mTextEntry, LLUICtrl::onCommit(), LLUICtrl::setTentative(), and LLLineEditor::setValue(). Definition at line 425 of file llcombobox.cpp. References getCurrentIndex(), hideList(), mAllowTextEntry, mTextEntry, LLUICtrl::onFocusLost(), and LLLineEditor::selectAll(). Definition at line 670 of file llcombobox.cpp. References gFocusMgr, NULL, S32, and LLFocusMgr::setKeyboardFocus(). Definition at line 699 of file llcombobox.cpp. Definition at line 980 of file llcombobox.cpp. Definition at line 865 of file llcombobox.cpp. References LLKeyboard::currentKey(), FALSE, LLLineEditor::getText(), gKeyboard, KEY_BACKSPACE, KEY_DELETE, KEY_DOWN, KEY_LEFT, KEY_RIGHT, KEY_UP, llmax(), llmin(), LLUICtrl::mCallbackUserData, LLLineEditor::selectAll(), and LLUICtrl::setTentative(). Definition at line 1091 of file llcombobox.cpp. References clearRows(), FALSE, LLCtrlSelectionInterface::OP_DELETE, and TRUE. Definition at line 1081 of file llcombobox.cpp. References LLScrollListCtrl::deleteSelectedItems(), FALSE, mList, LLCtrlSelectionInterface::OP_DELETE, and TRUE. Definition at line 398 of file llcombobox.cpp. References LLScrollListCtrl::deleteSingleItem(), LLScrollListCtrl::getFirstSelected(), LLScrollListCtrl::getItemIndex(), mList, and LLScrollListCtrl::selectSimpleItem(). Definition at line 414 of file llcombobox.cpp. References LLScrollListCtrl::deleteSingleItem(), FALSE, getItemCount(), mList, and TRUE. Referenced by LLScriptEdCore::addHelpItemToHistory(), LLPanelObject::getState(), and LLPanelLogin::LLPanelLogin(). Definition at line 115 of file llcombobox.h. Referenced by LLPreviewGesture::addAnimations(), LLPreviewGesture::addSounds(), LLPanelGroupInvite::clear(), LLPanelObject::postBuild(), LLPanelDeviceSettings::refresh(), LLFloaterBuyLandUI::refreshUI(), LLPanelGroupInvite::update(), LLPanelGroupInvite::updateLists(), and LLFloaterTools::updatePopup(). Definition at line 265 of file llcombobox.cpp. Definition at line 153 of file llcombobox.h. Referenced by LLScriptEdCore::addHelpItemToHistory(), fromXML(), and LLFloaterWorldMap::postBuild(). Definition at line 154 of file llcombobox.h. Definition at line 794 of file llcombobox.cpp. References LLView::addChild(), LLViewBorder::BEVEL_NONE, FALSE, FOLLOWS_BOTTOM, FOLLOWS_RIGHT, FOLLOWS_TOP, LLRectBase< Type >::getHeight(), LLButton::getLabelSelected(), LLControlGroup::getS32(), LLRectBase< Type >::getWidth(), mAllowTextEntry, mArrowImageWidth, LLRectBase< Type >::mBottom, mButton, mMaxChars, LLView::mRect, LLRectBase< Type >::mRight, mTextEntry, mTextEntryTentative, LLRectBase< Type >::mTop, NULL, LLStringBase< char >::null, onTextCommit(), onTextEntry(), S32, LLUI::sConfigGroup, LLLineEditor::setCommitOnFocusLost(), LLView::setFollows(), LLView::setFollowsAll(), LLLineEditor::setHandleEditKeysDirectly(), LLLineEditor::setIgnoreTab(), setLabel(), LLView::setRect(), LLLineEditor::setSelectAllonFocusReceived(), LLUICtrl::setTabStop(), LLLineEditor::setText(), LLView::setVisible(), LLFontGL::sSansSerifSmall, LLViewBorder::STYLE_LINE, and TRUE. Referenced by fromXML(), and LLPanelLogin::LLPanelLogin(). Definition at line 436 of file llcombobox.cpp. References LLRectBase< Type >::getHeight(), LLControlGroup::getS32(), LLRectBase< Type >::getWidth(), mArrowImageWidth, mButton, mDrawArrow, LLView::mRect, mTextEntry, LLLineEditor::reshape(), LLUI::sConfigGroup, LLView::setVisible(), and TRUE. Definition at line 1018 of file llcombobox.cpp. Definition at line 1045 of file llcombobox.cpp. References LLScrollListCtrl::getSimpleSelectedItem(), mList, LLScrollListCtrl::selectByID(), and setLabel(). Referenced by LLPreviewGesture::refresh(), LLPanelGroupInvite::update(), and LLPanelGroupInvite::updateLists(). Definition at line 479 of file llcombobox.cpp. References LLScrollListCtrl::getSimpleSelectedItem(), mList, LLScrollListCtrl::selectNthItem(), and setLabel(). Referenced by LLPreviewGesture::addKeys(), LLPreviewGesture::addModifiers(), LLPanelLogin::addServer(), LLFloaterSnapshot::Impl::comboSetCustom(), LLPanelObject::getState(), LLToolsUseSelectionForGrid::handleEvent(), LLPanelClassified::initNewClassified(), LLPanelLogin::LLPanelLogin(), LLPreviewGesture::loadUIFromGesture(), LLPanelPermissions::onCommitClickAction(), LLPanelGeneral::postBuild(), LLPanelDisplay::postBuild(), LLPanelClassified::postBuild(), LLFloaterTools::postBuild(), LLPanelPermissions::refresh(), LLPanelGeneral::refresh(), LLPanelLandOptions::refresh(), LLPanelLogin::refreshLocation(), LLFloaterBuyLandUI::refreshUI(), selectFirstItem(), selectNthItem(), LLFloaterTools::updatePopup(), and LLPanelDisplay::~LLPanelDisplay(). Definition at line 222 of file llcombobox.cpp. Referenced by LLPanelObject::clearCtrls(), LLPanelLandOptions::draw(), LLPanelObject::getState(), LLPreviewLSL::loadAsset(), LLPanelDisplay::onCommitWindowedMode(), LLPanelDisplay::postBuild(), LLPreviewGesture::refresh(), LLPanelPermissions::refresh(), LLPanelClassified::refresh(), LLPanelLandOptions::refresh(), and LLFloaterTools::updatePopup(). Definition at line 989 of file llcombobox.cpp. References LLScrollListCtrl::clearSearchString(), mList, and LLUICtrl::setFocus(). Definition at line 374 of file llcombobox.cpp. References FALSE, mAllowTextEntry, mButton, mList, mTextEntry, mTextEntryTentative, LLScrollListCtrl::selectSimpleItem(), LLButton::setDisabledLabel(), LLButton::setDisabledSelectedLabel(), LLButton::setLabelSelected(), LLButton::setLabelUnselected(), LLUICtrl::setTentative(), and LLLineEditor::setText(). Referenced by LLScrollListCtrl::addColumn(), LLPanelDisplay::onCommitAutoDetectAspect(), LLColumnHeader::onSelectSort(), setAllowTextEntry(), setCurrentByID(), setCurrentByIndex(), setSelectedByValue(), setSimple(), and setValue(). Definition at line 168 of file llcombobox.h. Definition at line 1061 of file llcombobox.cpp. References LLScrollListCtrl::getSimpleSelectedItem(), mList, setLabel(), and LLScrollListCtrl::setSelectedByValue(). Definition at line 312 of file llcombobox.cpp. References FALSE, mList, LLScrollListCtrl::selectSimpleItem(), and setLabel(). Referenced by LLScriptEdCore::addHelpItemToHistory(), LLPanelDeviceSettings::cancel(), LLPanelObject::getState(), LLPreviewGesture::loadUIFromGesture(), LLPanelDeviceSettings::refresh(), and LLPanelLandOptions::refresh(). Definition at line 855 of file llcombobox.cpp. References mTextEntry, LLLineEditor::setText(), and updateSelection(). Referenced by LLPanelLogin::LLPanelLogin(), LLPanelGeneral::postBuild(), and LLPanelLogin::refreshLocation(). Definition at line 169 of file llcombobox.h. Definition at line 325 of file llcombobox.cpp. References LLScrollListCtrl::getFirstSelected(), LLScrollListCtrl::getSimpleSelectedItem(), mList, LLCtrlSelectionInterface::selectByValue(), and setLabel(). Definition at line 511 of file llcombobox.cpp. References LLScrollListCtrl::arrange(), BELOW, FALSE, LLScrollListCtrl::getFirstSelected(), LLRectBase< Type >::getHeight(), LLView::getLocalRect(), LLView::getRect(), LLView::getRootView(), LLWindow::getSize(), LLRectBase< Type >::getWidth(), LLView::getWindow(), gFocusMgr, LLView::hasMouseCapture(), llfloor(), llmin(), LLView::localPointToScreen(), LLView::localRectToOtherView(), LLRectBase< Type >::mBottom, mButton, LLRectBase< Type >::mLeft, mList, mListPosition, LLView::mRect, LLRectBase< Type >::mTop, LLVector2::mV, LLCoord::mY, LLScrollListCtrl::reshape(), S32, SCROLLBAR_SIZE, LLScrollListCtrl::selectFirstItem(), LLScrollListCtrl::setFocus(), LLRectBase< Type >::setLeftTopAndSize(), LLFocusMgr::setMouseCapture(), LLView::setOrigin(), LLRectBase< Type >::setOriginAndSize(), LLButton::setToggleState(), LLFocusMgr::setTopCtrl(), LLView::setVisible(), LLUI::sGLScaleFactor, LLView::translate(), LLView::translateIntoRect(), TRUE, VY, x, and y.
Referenced by handleKeyHere(), handleUnicodeCharHere(), and LLColumnHeader::showList(). Definition at line 1038 of file llcombobox.cpp. Definition at line 304 of file llcombobox.cpp. References mList, LLScrollListCtrl::sortByColumn(), and TRUE. Referenced by LLScriptEdCore::onBtnDynamicHelp(), and LLFloaterSettingsDebug::postBuild(). Definition at line 939 of file llcombobox.cpp. References LLScrollListCtrl::deselectAllItems(), LLLineEditor::endSelection(), FALSE, LLLineEditor::getCursor(), LLScrollListCtrl::getSimpleSelectedItem(), LLLineEditor::getText(), LLLineEditor::getWText(), LLLineEditor::hasSelection(), LLUICtrl::mCallbackUserData, mList, mPrearrangeCallback, mTextEntry, mTextEntryTentative, LLScrollListCtrl::selectSimpleItem(), LLScrollListCtrl::selectSimpleItemByPrefix(), LLLineEditor::setSelection(), LLUICtrl::setTentative(), LLLineEditor::setText(), utf8str_to_wstring(), and wstring_to_utf8str(). Referenced by LLFloaterSettingsDebug::postBuild(), and setTextEntry(). Definition at line 192 of file llcombobox.h. Referenced by acceptsTextInput(), getSimple(), getValue(), getXML(), onCommit(), onFocusLost(), setAllowTextEntry(), and setLabel(). Definition at line 190 of file llcombobox.h. Referenced by LLColumnHeader::draw(), draw(), and LLComboBox(). Definition at line 191 of file llcombobox.h. Referenced by LLComboBox(), setAllowTextEntry(), and setButtonVisible(). Definition at line 186 of file llcombobox.h. Referenced by draw(), and LLComboBox(). Definition at line 184 of file llcombobox.h. Referenced by clear(), draw(), hideList(), LLColumnHeader::LLColumnHeader(), LLComboBox(), setAllowTextEntry(), setButtonVisible(), setEnabled(), LLColumnHeader::setImage(), setLabel(), LLColumnHeader::showList(), and showList(). Definition at line 188 of file llcombobox.h. Referenced by LLColumnHeader::draw(), draw(), and setButtonVisible(). Definition at line 187 of file llcombobox.h. Definition at line 185 of file llcombobox.h. Referenced by add(), addColumn(), addElement(), addSimpleElement(), clear(), clearColumns(), clearRows(), LLColumnHeader::draw(), getCurrentID(), getCurrentIndex(), getCurrentUserdata(), getItemCount(), getSimple(), getSimpleSelectedItem(), getSimpleSelectedValue(), getValue(), getXML(), handleKeyHere(), handleUnicodeCharHere(), hideList(), isDirty(), isSelected(), LLColumnHeader::LLColumnHeader(), LLComboBox(), LLColumnHeader::onClick(), operateOnSelection(), remove(), resetDirty(), setColumnLabel(), setCurrentByID(), setCurrentByIndex(), setFocus(), setLabel(), setSelectedByValue(), setSimple(), setValue(), LLColumnHeader::showList(), showList(), sortByName(), and updateSelection(). Definition at line 195 of file llcombobox.h. Referenced by LLColumnHeader::LLColumnHeader(), and showList(). Definition at line 193 of file llcombobox.h. Referenced by getXML(), and setAllowTextEntry(). Referenced by setPrearrangeCallback(), and updateSelection(). Definition at line 189 of file llcombobox.h. Referenced by clear(), getSimple(), getValue(), onCommit(), onFocusLost(), setAllowTextEntry(), setButtonVisible(), setLabel(), setTextEntry(), and updateSelection(). Definition at line 194 of file llcombobox.h. Referenced by setAllowTextEntry(), setLabel(), and updateSelection().